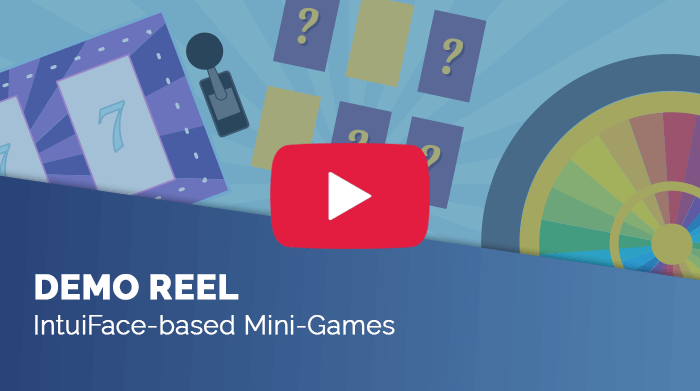 Use interactive mini-games to increase engagement without having to write code. we've created the following mini-games for use in all of your IntuiFace experiences. They're free to use and fully customizable, enabling you to add your own graphics and audio files. Use them to help you teach, inform and enlighten. Memory games require concentration, making them a great compliment for educational activities. Use this game to test retention or to just have a little fun! Running a promotional campaign and have goodies or coupons to hand out? Use an interactive slot machine in your store or tradeshow, giving people a chance to win prizes. You decide on the odds of winning! You know it from a popular TV show but wheels are also widely used in stores or at tradeshows to bring gambling excitement. Why not do it on a touch screen? It's a great way to engage customers and excite an audience. We've all scratched a lottery ticket and now you can do it on a touchscreen with your finger. Great for promotional events in order to hand out discounts. Not your average cardboard jigsaw puzzle, this one is touch-enabled. Puzzles are great for engaging the kid in all of us while getting users to focus on a specific image. They will remember it for a long time afterwards. Touch screens are a perfect delivery vehicle for quizzes. Use them for education, promotion or even events. Use games as a fun and interactive way for shoppers to win prizes. Great for engaging children, it's a novel approach to grabbing visitor attention. Games can foster attention and generate traffic for your screens. Give your customers something to occupy their time throughout service. Use for promotion, announcements or to foster word-of-mouth marketing. Kids learn best when they are having fun, so make it fun! Try them yourself! They're free!